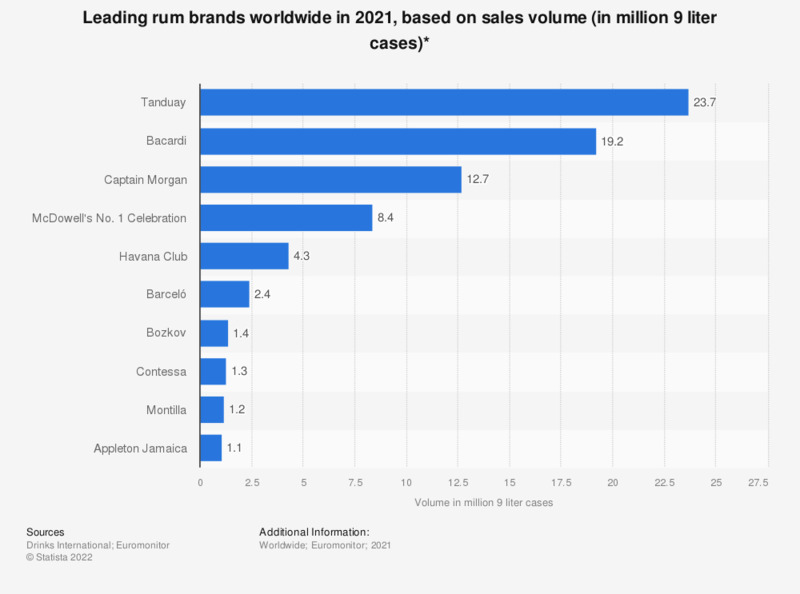 This statistic presents the leading rum brands worldwide in 2017, based on sales volume. Bacardi was the second largest global rum brand that year, with a sales volume of about 16.8 million-9 liter cases. The term “spirits” refers to an alcoholic beverage that has been distilled, contains no added sugar, and has at least 20 percent alcohol by volume. The term is derived from the medieval practice of alchemy and refers to the essential liquid element obtained from a substance through distillation, the “spirit” of the substance, so to speak. Popular spirits include whiskey, rum, vodka, tequila, and gin, among others. Statistics on "Spirits brands: Bacardi"